Michael Phelps "sorry" for acting "in a youthful and inappropriate way"
(CNN) -- Olympic gold medalist Michael Phelps admitted to "regrettable" behavior Sunday and vowed it wouldn't happen again after a British newspaper published a photograph of the swimmer smoking from a bong. "I acted in a youthful and inappropriate way," swimmer Michael Phelps said in a statement released Sunday. "I'm 23 years old, and despite the successes I have had in the pool, I acted in a youthful and inappropriate way, not in a manner that people have come to expect from me," Phelps said. "For this, I am sorry. I promise my fans and the public -- it will not happen again." People often use bongs to smoke marijuana. Phelps won a record eight gold medals at the 2008 Summer Olympics in Beijing, China, four years after he won six gold medals at the Summer Olympics in Athens, Greece. He has received numerous corporate endorsements totaling millions of dollars. His statement was also posted on his Facebook page, followed by comments of both support and admonishment from fans. In a separate statement, the U.S. Olympic Committee said it was "disappointed in the behavior recently exhibited by Michael Phelps." "Michael is a role model, and he is well aware of the responsibilities and accountability that come with setting a positive example for others, particularly young people," the committee said. "In this instance, regrettably, he failed to fulfill those responsibilities." However, it added, "Michael has acknowledged that he made a mistake and apologized for his actions. We are confident that, going forward, Michael will consistently set the type of example we all expect from a great Olympic champion." The picture, billed as an exclusive by the tabloid News of the World, showed Phelps using a water pipe during what it said was a November party at the University of South Carolina. In 2004, Phelps was arrested on charges of driving under the influence in Salisbury, Maryland. Phelps pleaded guilty and received 18 months probation in that incident, issuing an apology afterward. "Getting into a car with anything to drink is wrong. It's dangerous and it's unacceptable. 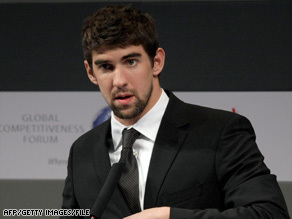 I'm 19, but was taught that no matter how old you are, you take responsibility for actions, which I do," Phelps told ESPN. The Olympic swimmer is one of 12 Olympic athletes that have pledged to "My Victory," an initiative launched last year by the U.S. Anti-Doping Agency to keep competitive sports clean of cheating and drug use.